Do you like this house? Check out our new project for mountain chalet! You can build your dream house or villa with us! 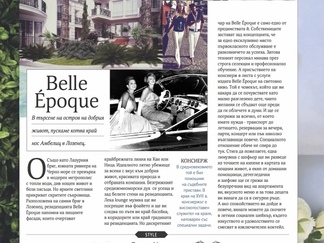 In the April's issue of No 1 women's magazine in Bulgaria - Amica publishes an advertorial for our newly built Residence Belle Epoque and the seaside resort of Lozenets. The material is titled "Belle Époque: In search of the good life, we drop an anchor near Cape Ambelits in Lozenets". 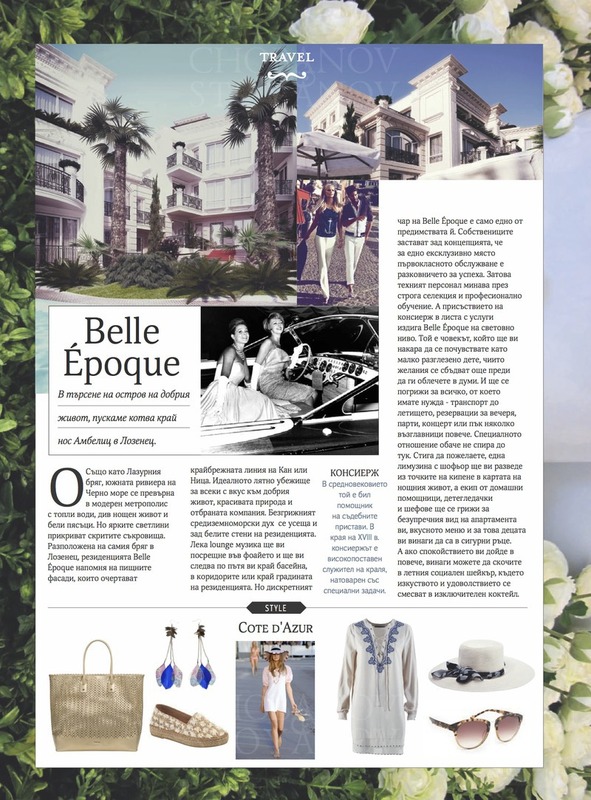 The readers of the magazine get familiar with the atmosphere of our residence and its main advantages - "The ideal summer retreat for anyone with a taste for good life, beautiful scenery and special company". Amica is the most influential women's magazine in Italy. It entered the Bulgarian market in 2007 with a license from media group RCS periodici S.p.A. AMICA belongs to the highest class of Italian monthly magazines. In 2005 it was first in circulation among the female magazines in Italy with 1 347 000 readers. The Bulgarian edition of AMICA is for the modern urban woman - intelligent, sensitive, challenging, and interested in the new things. AMICA retains its strong fashion profile of the original magazine and has own style and recognizable vision, as an ambassador of good taste on the developing Bulgarian fashion market. The text of the article is published here without abridgement. Belle Époque: In search of the good life, we drop an anchor near Cape Ambelits in Lozenets. Just like Cote d'Azur, the southern Black Sea Riviera has become a modern metropolis with warm sea water, wild nightlife and white sands. But the bright lights hide the hidden treasures. Located on the beach in Lozenets, the Belle Époque residence is reminiscent of the ornate facades that are outlining the seaside promenades of Cannes or Nice. It is the ideal summer retreat for anyone with a taste for good life, beautiful scenery and special company. The carefree Mediterranean spirit is felt behind the white walls of the residence as well. The quiet lounge music that meets you in the lobby, follows you on your way to the swimming pool and then in the corridors or in the garden of the residence. The discreet charm of Belle Époque residence is just one of its advantages. The owners stand behind the concept that the first class service is the key to success for every exclusive site. That is why, the staff of the complex goes through a rigorous selection and professional training. The presence of a concierge in the list of services makes Belle Epoque residence recognizable worldwide. This is the person who will make you feel like a little spoiled child whose wishes come true before they even come in words. And this person will take care of everything you need - transportation to the airport, reservations for dinner, party, concert or a few more pillows. The special treatment does not stop here. If you want, a limousine with a driver will show you around boiling the hottest nightlife spots, while a team of maids, nannies and chefs will take care of the flawless appearance of your apartment, the delicious menu and the safety of your children. And if this peaceful atmosphere is more than you can handle, you can always try the Lozenets’ summer social shaker where art and pleasure mix in an exclusive cocktail. © 2014 Copyright Amica Bulgaria. © 2004-2018 Choston Ltd. All Rights Reserved. CHOSTON and the logos are trade marks of Chobanov and Stoyanov Ltd.
Website: contents CHOSTON, design HOTDRINK, concept BONONIA, programming and database EBPW.